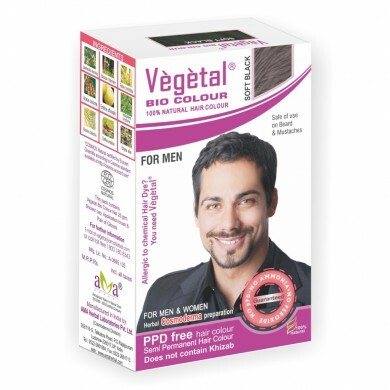 Offers Available: - Get Flat 14.00% Off on VEGETAL BIO COLOUR SOFT BLACK FOR MEN 25 GMS. No Coupon Code Required To Avail This Offer. Coloring your hair is no more a matter of hassle now. Use this PPD free and ammonia free natural hair dye to color your hair and glamorize your look like never before. 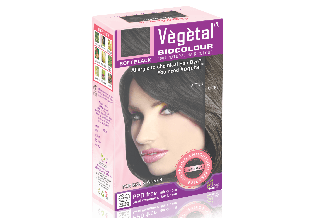 Put on the gloves given inside the pack to apply Vegetal® Bio Color from the root to the tip of your hair with the help of a comb and brush. You can also apply this semi-permanent hair color on your moustache and beard. This natural hair color works great even if your hair is colored with henna/chemical dyes. Indigofera tinctoria (Indigo)40%, Lawsonia inermis (Henna)30%, Accacia catechu (Khair)5%, Rubia cardifolia (Manjistha) 15%, Coffea arabica (Coffee)2%, Accacia concinna (Shikakai)3%, Emblica officinalis (Amla)2% Eclipta alba (Bhringraj) 2%, Baccopa monnieri (Bramhi)1%. Ayurvedic Proprietary Medicine. Comment :Its good , its very nice alternative to chemical dyes .. its texture , feel all shows its natural . It gives good results also .. though it took 5 days to reach me , but at the end good result.